Case-Shiller was out with its July home price survey. It followed the trend of improving prices established over the last couple of months. 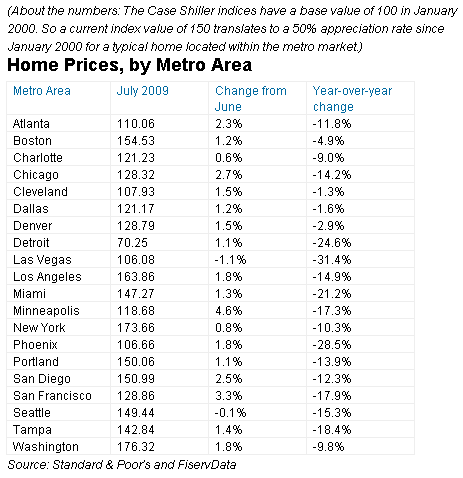 Nationwide prices were up 1.6% and the number of cities showing price declines dwindled to just two. Here are the numbers for the twenty cities in the survey. Whether these numbers represent a sustainable recovery for the housing market or just reflect the impact of low prices, pent up demand and government subsidies via low interest rates and tax credits is a matter of much debate. There is a considerable body of opinion that holds significant problems lie ahead inasmuch as there is considerable inventory yet to hit the market. That meme has been bandied around for some time with little data actually prove the thesis. During the depths of the recession and particularly while housing looked as if it had an impossible mountain to climb, it was pretty much an article of faith that the largest impediment to clearing the backlog would be the lack of financing as lenders returned to sensible underwriting standards. The logic being that fewer new buyers would be able to pony up larger downpayments and that even when they could do so, qualification criteria would winnow the number of eligible borrowers. The reason for this financial deterioration is that FHA is underwriting record numbers of high-risk mortgages. Between 2006 and the end of next year, FHA’s insurance portfolio will have expanded to $1 trillion from $410 billion. Today nearly one in four new mortgages carries an FHA guarantee, up from one in 50 in 2006. The Journal also reported that loans 30 or more days delinquent have climbed to 14$ of its portfolio. For the sake of comparison, that’s about two to three times the rate for conventional loans and puts it more in line with subprime type loan performance. The default rate is increasing most rapidly on loans extended over the past two years. So it would seem that government subsidies to an already heavily subsidized industry combined with a return to suspect mortgage underwriting is largely responsible for what appears to be a modest recovery of the housing market. We know from recent history that you can move houses with loose money, so it’s of little surprise that houses are moving briskly at the low end when the incentives are thrown into the mix. Unfortunately, recent history indicates that this is tantamount to building on quicksand. My conclusion is that we have an artificial bounce in home prices driven by government programs. How long the trend continues depends on how long the politicians decide to stay in the game. They’ll probably double down and extend the tax credit and sweep the problems at FHA under the rug for awhile. That should keep the merry-go-round spinning a bit longer. The upshot of all of this is that we haven’t truly moved off of the system that landed us in this pickle to begin with. Artificial stimuli in the form of subsidies and irresponsible lending are driving the market and buyers are rationally responding to them. Maybe we squeak through this little episode or maybe it just leads to another crash. It’s too soon to tell. One thing we haven’t done is to get back to a market that operates on reasonable fundamentals.